The Association for Computing Machinery (ACM) has named David Haussler, professor of biomolecular engineering and director of UCSC's Center for Biomolecular Science and Engineering (CBSE), a corecipient of the 2003 Allen Newell Award. Haussler was recognized along with UCLA computer scientist Judea Pearl for separate groundbreaking contributions that have changed the scientific world beyond computer science and engineering. 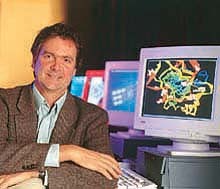 Haussler, a Howard Hughes Medical Institute investigator, was cited as possibly the most influential contributor to the field of computational biology. Pearl, director of UCLA's Cognitive Systems Laboratory, made seminal contributions to the field of artificial intelligence. As the recipients of the 2003 Allen Newell Award, they demonstrate the remarkable influence that computer science and artificial intelligence can have on other sciences, on practical tools, and on human thought. The Allen Newell Award, which is cosponsored by ACM and the American Association for Artificial Intelligence (AAAI), comes with a cash prize of $10,000. By focusing on scientific interactions between computer scientists and molecular biologists, Haussler has played a leading role in developing the new field of computational biology. His work laid the foundation for the modern probabilistic approach to detecting and analyzing the biological components of the human genome. His collaborations led to algorithms to assemble the first public working draft of the human genome and posting it on the World Wide Web. He also aided in developing interactive web-based browsers that analyzed and annotated genome sequences of human beings and other organisms. These web-based tools are used extensively in biomedical research. Haussler is a fellow of both the American Association for the Advancement of Science (AAAS) and the American Association of Artificial Intelligence (AAAI). He earned a Ph.D. in computer science from the University of Colorado and an M.S. in applied mathematics at California Polytechnic State University. A graduate of Connecticut College with a B.A. in mathematics, Haussler is a past chairman of the Steering Committee for the Computational Learning Theory Conferences (COLT) and associate editor of the Journal of Computational Biology. Pearl, a professor of computer science at UCLA, realized the overwhelming prevalence of uncertain information in real-world systems and developed a theoretical and algorithmic foundation for artificial intelligence based on probability theory. He forged links between computer science and statistics, developing models that are used to describe everything from the effects of diseases to the likely behavior of terrorists. Pearl's ideas have revolutionized the understanding of causality in statistics, psychology, medicine, and the social sciences. His book Probabilistic Reasoning in Intelligent Systems is among the single most influential works in shaping the theory and practice of knowledge-based systems. Pearl graduated from Polytechnic Institute of Brooklyn, where he earned a Ph.D. in electrical engineering. He received an M.S. in physics from Rutgers University and a B.S. in electrical engineering from the Technion, in Haifa, Israel. A member of the National Academy of Engineering, Pearl is a fellow of AAAI and of the Institute of Electrical and Electronics Engineers (IEEE). He is president of the Board of Directors of the Daniel Pearl Foundation, and has asked that his share of the Allen Newell Award be donated to the foundation. ACM will present the Allen Newell Award at the annual ACM Awards Banquet on June 5 at the Plaza Hotel in New York. The award was named for Allen Newell, a pioneer in artificial intelligence. It is presented to an individual selected for career contributions that have breadth within computer science, or that bridge computer science and other disciplines. This endowed award is supported by the American Association for Artificial Intelligence and by individual contributions.